Last week Microsoft summoned journalists to Hollywood for a major product announcement. 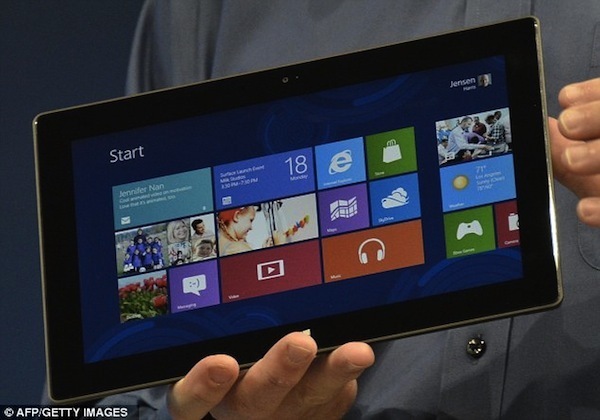 What they unveiled was Surface, a new tablet computer that will run Windows 8. Microsoft is going to control both the hardware and software platforms for this device. It will be manufactured and marketed as a Microsoft product and compete directly for sales with companies that are otherwise partners in the PC business. Although Microsoft is no stranger to this approach in the games market – its Xbox console is among the market leaders – this is a major change of strategy in the mainstream PC market, where previously the company has licensed its software to a range of 3rd party vendors and left them free to design, build and sell the hardware it runs on. This strategy led to mega-profits, as the marginal cost of each new copy of Windows and Office sold was close to zero. Microsoft dominated the technology sector and was for a time the world’s most valuable company. So why change a winning formula? And why risk antagonising a whole raft of your most valuable partners? A hint lies in the identity of the company that is now wears Microsoft’s old crown and is rated the world’s most valuable business: Apple. Apple now exceeds Microsoft (and incidentally Google) in operating margin percentage, despite the vast majority of their revenues coming from hardware sales. Apple’s thing has always been controlling the whole customer experience through tightly integrated hardware and software. Its model is cheap (or free) software running on moderately priced hardware; Microsoft’s has always been expensive software running on cheap hardware. Mobile industry analyst Horace Dediu estimates that Microsoft makes a net operating profit of $78 per PC sold, assuming that PC has both Windows and Office installed (and most do). Apple, by contrast, makes $195 of operating profit per iPad sold. Sure, Microsoft has bigger volumes – there were 336 million Windows PCs sold last year – but that will change. The iPad has created a new market that is growing rapidly, which is disrupting the PC market and in which there is almost no competition. It is a market in which Microsoft’s traditional model is doomed to failure. It simply cannot maintain its current per-device profits selling Windows and Office to 3rd party vendors when Android is free and Office-like software is available at a fraction of the cost. Surface offers the Redmond giant a way out. If it can sell the devices at the same prices Apple sells its iPads for it can maintain its profits (at least on a per device basis). The problem will be making and selling enough of them. And as we still don’t know – more than a week after the launch event – when Surface tablets will be available or how much they will cost, it is hard to know if they will succeed. While the PC market is not going to die anytime soon Microsoft needs a new strategy – for now, Surface looks like its big bet. A place to live, work and stay? The Carpenters Estate, on the fringes of the Olympic Park in Stratford, is going to be demolished to make way for a new east London campus for University College London. The residents are, understandably, not happy about this and I have a great deal of sympathy for their position. It seems perverse at a time when there is a desperate need for affordable housing in London that an estate of perfectly serviceable homes is to be bulldozed and replaced by a university campus. The borough’s motto is ‘a place to live, work and stay.’ How are people supposed to stay if you knock their homes down? It is all very well Sir Robin banging on about building resilient communities, but how can communities develop resilience if they are scattered to the four corners of the borough – or indeed beyond – because their homes are demolished and they can’t afford anything else? How many of the flats in the shiny new blocks springing up in Stratford are truly ‘affordable’ to Newham people? This language of ‘resilience’ is basically about blaming the poor for their own condition. Too poor to afford some where to rent or buy? Don’t know how to negotiate the bureaucracy to get yourself re-housed? Confused by complex forms and processes? The services you use and rely on no longer exist because of budget cuts? Tough. Not our problem. Go away. Sir Robin claims to be ambitious for Newham, but he seems not to have much empathy for the people who actually live here.